The Gonzo’s Quest slot machine can be played at the Oranje Casino in both the online casino and the mobile casino. Players always have the opportunity to play the game free of charge or in the online casino in the practice mode, where fictional play money is provided. In order to be able to bet on this slot machine for money, it is necessary to first create an account or log in with the username and password. When the game is open, a screen is displayed with five vertical and three horizontal rows. No roles are spoken in this case, because the symbols do not turn, but they fall. 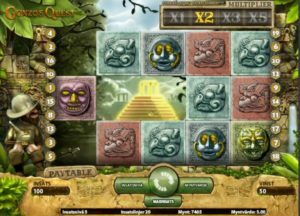 The story of Gonzo’s Quest slot machine brings the player back to a distant past, in which Gonzalo Pizzaro went looking for the city of Eldorado. The symbols are based on this theme and Gonzo himself is obviously not missing in the story, because it is placed next to the rows. There are a total of twenty paylines available and only the highest winning combination on an active payline comes to payout. That there are no rotating roles, but falling blocks is an interesting and attractive fact in itself, but there are more striking features to note. For example, the avalanche function that can play a role after every spin. The avalanche function means that blocks with symbols that form a winning combination will explode, after which an avalanche of new blocks with symbols replaces them. That is not the only thing, because after each avalanche the multiplier will grow further. In the first avalanche there is no question of a multiplier, but in the second avalanche, if there is a winning combination, the win doubles by a factor of two. That will already be factor three at the moment that there is a third consecutive winning combination and ends with a factor of five if there has been four times an avalanche that has led to a winning combination of blocks with symbols. In the game of Gonzo’s Quest slot machine it is possible to win free spins. That is not called free spins, but free falls because the blocks fall. With three free fall symbols access is given to the bonus round with free spins. A total of 10 free falls will then be made available. Extra interesting is the avalanche function in combination with the multiplier that can rise to a maximum of 15 in this round, but can also be a factor of three, six or nine during the round with free falls. Finally, there is a wild symbol in the shape of a question mark that is depicted on a block. The question mark can replace all other symbols and there is no exception according to the rules for the free falls symbols. There are five bet levels available that the player can set as desired and with regard to the coin value there are variations between 0.01 euro and 0.50 euro.